If you’ve previously been a wood stove user and you’re looking for the same kind of heated feel in your home, you’ll find a pellet stove is a great, eco-friendly and highly efficient alternative. With different aesthetic options, from glass windows to wall-mounted stoves, finding a pellet stove to fit your room will be a breeze. However, always consider the size of your room and the functionalities that suit you and your family. Here are a few tips to help you get started. Pellet stoves are powered by pellets of densely compressed wood or biomass. Stoves have a hopper, which is where the pellets are inserted, and it is usually found either on the top or on the bottom of your pellet stove. These pellets are moved from the hopper to the burn pot by a motorized device called an auger. The speed of the auger affects the temperature of the stove, and this is determined by an internal thermostat that measures the temperature and checks when more pellets should be added. Some augers feed on the top, with the pellets entering vertically whereas others load from the bottom, moving the pellets in horizontally. The burn pot can be found inside the combustion chamber. It is ignited, and the compressed pellets create a hot flame due to their density, and lack of moisture. The burn pot allows air and fuel to mix together, burning up the pellets and creating heat. The combusted material becomes ash that is caught in the ash pot. When selecting a wood pellet stove, the first thing to consider is the size of the space you are considering heating. The stove needs to be able to heat effectively but without becoming inefficient. For every 200 square feet of space, you need about 5000 BTU (British Thermal Units). Your stove should indicate its output when you purchase it. If you do not have a stove that outputs enough heat, it won’t work properly. However, a stove with too much heat will force you to burn the pellets on a low heat, running the risk of polluting the air and wasting fuel. Regarding this, looking for efficiency ratings will also help to ensure that you have a stove that’s worth buying. The next thing to consider is the ease of installation. First of all, if you do not have a flue or chimney in your house, you need to look for a model that does not need one for easy installation. Equally, sometimes it can be hard to find someone to install a stove if you do not purchase it from the manufacturer. With both these things in mind, find a stove that you can install yourself. Take into account the operation of the stove. In general, the more complex features the stove includes, the less control you have over the flame itself and the more automated the system is. Some stoves come with cleaning assistance, programmable controls, and loading settings. If you have children and pets, safety is probably a top priority. Think about how hot the unit gets on the outside as it can pose a risk of burning. Look for EPA certification to show that the stove is safe to use indoors. The aesthetic is also important. Some wood pellet stoves allow you to see the flames, whereas some do not. Equally, some have the feel of an old cast iron stove, compared to other designs that have a more sleek and modern finish, while some can be mounted on the wall to save space. High Efficiency - Due to the dense pellets, pellet stoves tend to have an EPA efficiency range rating of 70% to 83%, which is very good in comparison to other home heating systems. Easy-to-install - Unlike wood stoves which need to have a chimney, pellet stoves only need an air vent pipe, that is very easy to install. It will send out any noxious gases without the hard work of having to install a chimney. Easy maintenance - Because pellet stoves produce less smoke than wood burning stoves, you end up with less maintenance due to less creosote build-up. In this sense, they also burn more cleanly than wood or fossil fuels. 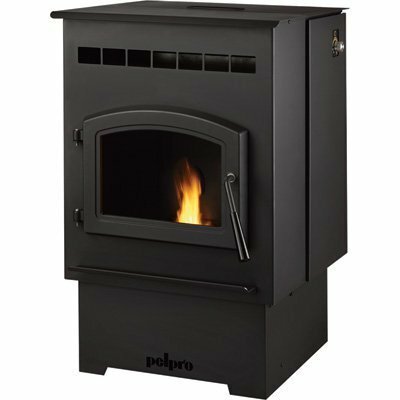 Good value for money - While the outlay of a pellet stove can be between $1000-$3000, they are quite easy to source, and the pellets are efficient for burning. As no chimney needs to be installed, their installation and running cost is lower than other heat sources. Needs electricity - The fan and the pellet feeder will need to use electricity to work. Pellets can be expensive - If you are limited to where you can buy pellets, you may find that you are not able to buy them in bulk and that local prices are quite high. Buying online should make it cheaper. Can be noisy - The motor and the fan can be quite loud, which some people find annoying. When choosing a pellet stove, it can be difficult to decipher which one suits you, due to the many aspects that need considering. However, here are a few of the best options to give you an idea of what to look for. 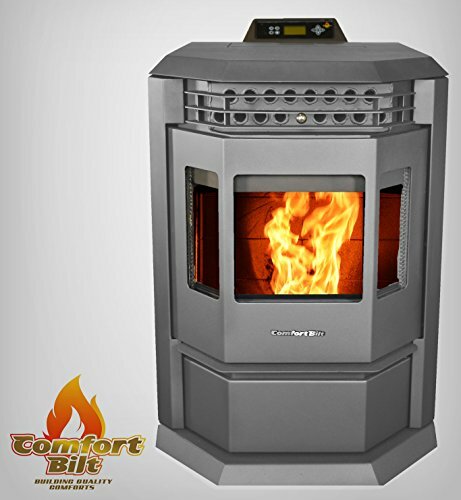 With 50000 BTU of heating capacity, this pellet stove can heat up to 28000 square feet. It is EPA certified, with a 86% burn efficiency and a powerful blower. It features an automatic ignition and a programmable thermostat. It has a 55-pound hopper capacity and a glass front window to see the fire. It is very quiet, even with the fan on. It heats the room very effectively and very quickly. It only needs to be clean biannually, making it easy to maintain. The sides and the top do not get hot, making it a safer option for children and pets. The rivets inside the hopper prevent about 5 pounds of pellets from ever reaching the burn chamber. There must be a non-combustible surface, such as ceramic tile, on the walls and floor surrounding this pellet stove. 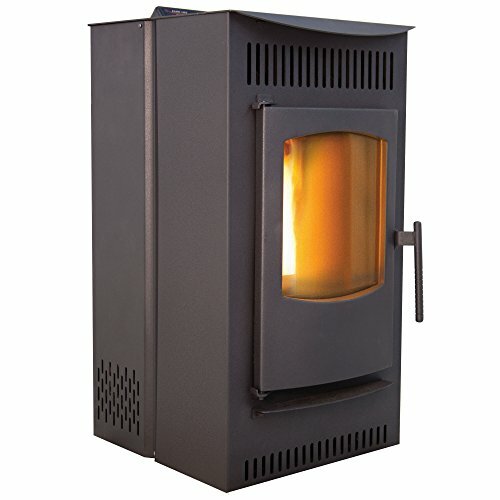 It is a very highly rated pellet stove with a great deal of functionality and very good for large spaces. It is easy-to-maintain but needs to be placed in a fireproof area. With a thermal efficiency greater than 68.7%, this pellet stove can heat up to 1050 square feet. There is a Smart controller that allows you to set it to the manual thermostat, or to weekly operational modes. It features a heat exchanger to decrease fuel usage for the same heat, with an easy-to-access ash pan and fire pot. The unit is direct vented meaning no need for a chimney and very easy installation. It is EPA and ETL certified, as well as Mobile Home certified, demonstrating its indoor safety in varying environments. The programmable controller allows various settings, enabling manual, thermostat, and weekly modes, as well as 5 burn settings. There are no hidden tubes or compartments, and the fire pot and ash pan are easily accessed. It makes this stove easy-to-clean and to maintain. The thermostat is not particularly accurate. There is no battery backup, and it cannot be hand-stoked, meaning it cannot be used if the electricity goes out. It is a powerful stove, for slightly smaller homes, that meets safety standards and allows for programmable functioning, which means less manual control. The thermostat is also a bit inaccurate, but overall this is a good model for smaller homes. With 50000 BTU, this stove is said to heat up to 2200 square feet. It is 85% efficient and features an extra-large hopper that can hold up 130 pounds of fuel, with extended burn times of up to 80 hours. There are three heat settings with an auto-ignition, a thermostat, and a blower. The stove and the fan are both very quiet. It produces very little ash due to the high efficiency of fuel consumption. The stove comes with a fresh air kit in order to introduce air from the outside. The automatic settings work well in changing the pellet input to balance the temperature. The lowest setting is a little too high. There is no ash pan making it a little harder to clean, but it only needs to be cleaned a couple of times a week. It is a great heater with excellent efficiency and good heating capacity. It is better for bigger spaces as the lower setting is quite high and the lack of removal ash pan can be a little annoying when cleaning. A very slim design, this pellet stove mounts directly on the wall to save space. Heating rooms of up to 1000 square feet, it comes with 5 heat settings and a fan blower. It comes with all fixtures and has a 28-pound hopper that can burn for 24 hours on the low setting. It has a battery backup option for when the power goes out. The slim, wall-mounted design makes it perfect for smaller spaces that don’t have much floor room. It is very easy-to-operate, as you just push a button and it starts. The digital pad makes it simple to change the settings. Although the outside gets a little warm, it is not hot enough to burn, making it relatively safe to be around children and pets. It does make a little bit of noise but nothing too disturbing. There is no thermostat and no way to hook one up to this stove. This stove is a good option for small spaces, especially if you have pets or children. It does not have a thermostat, which can be a little inconvenient, but it has 5 easy-to-change heat settings to help keep the room at a comfortable temperature. 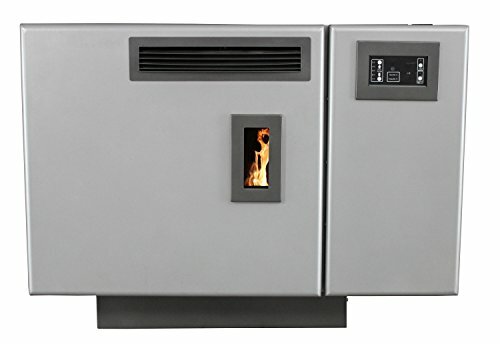 With a 60 pound hopper and automatic ignition, this stove can heat rooms of up to 1750 square feet. There is an inbuilt thermostat with a single dial for temperature adjustability and a powerful blower. It is very quiet, even with the fan blowing. It can hold a bag and a half of pellets, which means it needs to be refueled less often. It is also extremely efficient, saving money on pellets while running due to burning less fuel. The thermostat is very accurate and will run the stove at a consistent and comfortable temperature. It is not an easy stove to clean. The customer service is very hit and miss, and users who have complained often have to wait a while to hear back from the company. This stove is a good option for smaller to medium size homes. While it is easy to operate and works quite well, it is a little hard to clean, and the customer service is slow in the event of a problem. Maintaining your pellet stove is the best way to keep it working and to ensure its durability. Get a professional cleaner annually - Each year you will need to find a professional cleaner who is familiar with your model of stove. They can work through all the parts and ensure that everything is maintained and in good working order while preventing the buildup of pollutants which can cause fires. Often, the supplier will know of or have a cleaner to help with this maintenance process. Choose your pellets wisely - Cheap pellets of low quality may seem like a bargain, but in fact, they deteriorate the quality of your stove. They burn more quickly, and you ’ll find that they leave soot and buildup inside the stove. Clean the ash - Make sure to clean the ash out regularly to prevent it from backing up inside the stove. Clean the burn pot - It will also have some ash that doesn’t make it to the ash pan. You can use an ash vacuum, but never a household vacuum as the ash will break it. Clean the glass - If you have a glass-fronted stove, using vinegar and water will help you give a clear, non-smeared finish to the glass. Clear the heat exchangers -Make sure to clear them with a wire brush as it is where fresh air passes in and they are needed for clean combustion. Sometimes your stove will come with a special rod to reach into these tubes. Keep oiling up the motor - For motors to run effectively and quietly, they have to be oiled. You can use all-purpose or sewing machine oil to do this. 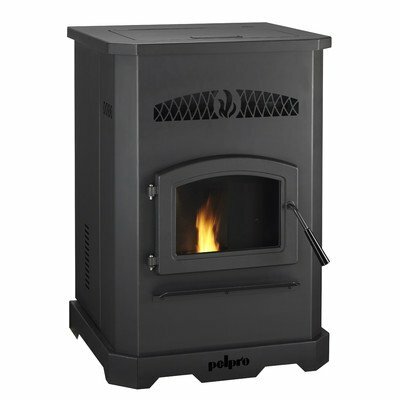 A pellet stove is an eco-friendly and energy efficient way of warming your house using fire. It brings a homely feel to the room and reaches high temperatures quickly, and the increased functionality of modern pellet heaters enables adjustable and consistent heat. Consider the size of your home and the aesthetics you want before selecting the features that best suit you.